David Clifton returns to his folk roots on this five track EP, which is also available in limited edition CD format as well as digital download. 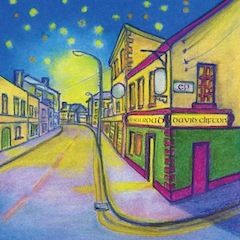 The title song, Old Sea Road, co-written with Phil Baggaley, celebrates a lively traditional music pub in Galway, Ireland. “We both visited Galway at different times; Phil whilst on holiday, and I walked this very road one afternoon when on tour playing for Mary Coughlan”. Places such as this often become the centre of thriving neighbourhoods, and this song is the story-telling and imagining of what it might have represented, many years ago, for some of inhabitants of this sea-faring town. 21st Century Song is a nod to the tendency of contemporary life to diminish the most important things; family, friends and relationships. Way On Home began an early folk song; the verse was first featured on the City of Gold album. Here it is in its original form, updated and re-written – with a nod to East Tennessee’s Smoky Mountains. The Water Is Wide is a new arrangement of the traditional English Somerset folk song, and Welcome Home is a mandolin folk instrumental, originally recorded in north London with Helen O’Hara. To download from iTunes, click “Buy Now”. For a free gift or to pay what you wish, click “Name Your Own Price”. Enter a zero amount or the amount of your choice. To order the CD/EP format, please click the relevant link once you have entered the download page from the “Name Your Own Price” tab. IQ Music/Little Room Music, administered in the USA by Wixen Music.